Adam has lived all his life in March, Cambridge. As a young lad when he was watching the speedway at Peterborough he decided that's what he wanted to do. Unfortunately there was no training schools around for a six year old so he made a start on the grass. After quite a successful six years racing he managed to get Peterborough to allow him to become their mascot on race nights. His junior speedway 125cc bike led to a to a 250cc at this time and he was itching to go racing. With the help of his step dad he managed to get rides at Mildenhall and Ipswich and rode in the under 15/16 British Championship his last time eligable in 2011. 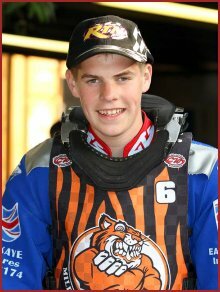 He continued to impress in 2011, finishing second in the first of six qualifying rounds of the re-branded British Youth Championship at Newport on 15 May. Indeed, he scored 11 out of 12 points from the heats, but had to settle for second spot in the final after the race was stopped when Adam Kirby took a tumble. Nathan Stoneman was declared the winner, with David Abraham third and Kirby fourth. Following some successful rides for Mildenhall he was snapped up by Dudley to replace Danny Stoneman in their mid-season shake up. His best meeting for the Heathens was on a night that most riders want to forget, on the 13th July 2011 some of the Dudley riders withdrew from the meeting because of the state of the track, poor Adam was forced into having extra rides, his grasstrack experience must have paid dividends because he scored four points from his four rides. He was left out of the Dudley team at the end of August. Adam rode in the Midland Development League in 2012 for Milton Keynes and got a league championship medal, he joined Long Eaton in 2013. Adam rode for Castleford in the Midland Development League in 2014 where he broke his scaphoid in May.